Manchester United legend Phil Neville has named the four players he’d love to bring to the club if he were in charge and money weren’t an issue. Interestingly, the former Red Devils defender went for some names who probably wouldn’t be top of most fans’ lists. 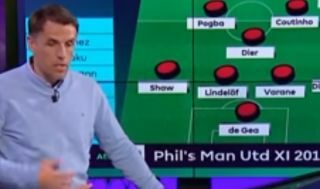 See the video above in which Neville explains his choices, with the England Women’s team manager picking Real Madrid pair Gareth Bale and Raphael Varane, along with Barcelona’s Philippe Coutinho and Tottenham’s Eric Dier to come in in midfield. That last one is particularly surprising, with the England international not exactly looking as convincing as he did a couple of years ago, having somewhat failed to really fulfil his true potential. Many might well think Dier would still be an upgrade on someone like Nemanja Matic, and in general Neville’s line up looks very strong, even if Bale and Coutinho have had somewhat indifferent times in La Liga this season.